Unown is one of the more unusual Pokémon with there being a total of 28 different forms. These forms take the appearance of the English alphabet, as well as an ! and ? Unown. These are determined randomly when Unown appears in Pokémon GO but as Unown spawns so rarely, you really have to be at the right place at the right time. There is, however, another way. 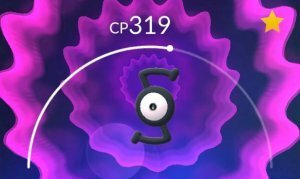 At many special events, Unown will suddenly appear in greater numbers in the forms of letters to associate with the event. There's no set pattern as to what event will get an Unown but it's typically dealt with by the organisers.